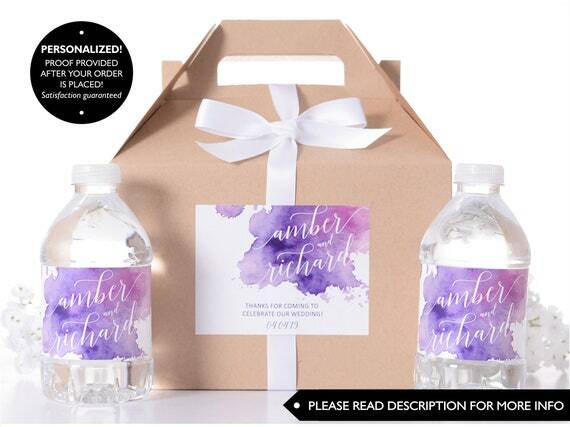 Each box set comes with the box (sizes listed below) box label, ribbon and 2 water labels. Your guests will love these adorable wedding welcome boxes! Perfect for saying "thanks for coming!" to your friends and family. Fill them with your favorite goodies for a truly unique wedding welcome gift. Choose from THREE different sizes! 1. Choose your desired box quantity/size from the drop-down menu. 2. Select your desired box color from the drop down menu and proceed to checkout. 3. Enter your customization and ribbon color choice in the "Personalization" box. 4. Complete checkout and wait for your digital proof to arrive! *PROOF PROVIDED AFTER ORDER IS PLACED. We do not offer proofs prior to purchase. STANDARD: 8" x 4-7/8" x 5-1/4"
LARGE: 9" x 6" x 6"
JUMBO: 10" x 7" x 8"
*NOTE: Sizes DO NOT include the gable peak. Height is measured to the top of the rectangular area. Boxes are shipped flat and are easy to assemble with the labels and ribbon. *The water bottles themselves ARE NOT included, just the labels. Please specify your choice in the NOTES TO LABELSRUS box during checkout. PROCESSING: Most orders are shipped within 24 hours of proof approval, but please allow a total of 1-2 days days in-house production time unless you need a rush job. We can almost always accommodate rush orders. Convo us for details, as extra fees apply. *NOTE: Our work hours are MON-FRI from 10am - 5pm. We DO NOT work on orders over the weekend. Delivery time can vary from 2-5 days, depending on shipping method and your location. *HAWAII AND ALASKA require additional surcharges. OVERNIGHT SHIPPING: Overnight Priority orders can be arranged in most circumstances, depending on stock. Quotes for Overnight prices are made according to ZIP code - please provide this upon requesting a quote. INTERNATIONAL ORDERS: Please message us with an inquiry. We will need to quote you on shipping according to location. CANCELLATIONS: Because we order box stock AS SOON as your purchase is made, cancellations/refunds ARE NOT available for box orders. Please be certain of your purchase before committing to your order. POST-SHIPMENT REFUNDS: Refunds and reprints are available for damaged, incomplete, or flawed orders ONLY. We do not offer refunds for customers who decide on a different color/font/box size after they have already approved their proofs. If you have made a mistake, reprints are usually available at a discounted price. GREY AREA CLAUSE: Since we are a company of humans and not robots, we acknowledge that we occasionally make mistakes on proofs. However, it is your responsibility to THOROUGHLY check over your proof so you can catch a mistake if it is made. If you approve a proof with a mistake made by us, we will re-print your order for a discounted cost. NO-READ, NO RETURN POLICY: We do not offer refunds on orders complaining of something that is clearly stated in our descriptions (dimensions, color, etc.) It is your responsibility as a customer to stay informed about the product you are purchasing. Please READ DESCRIPTIONS FULLY before placing an order so you know what to expect. Once you receive your proof, you have seven days to review and request a revision. If no response is received in this time, we reserve the right to ship your order as originally specified, especially if time limits are a concern. DAMAGE POLICY: Once we send your package to the post office, it's out of our hands. **WE ARE NOT RESPONSIBLE FOR MISPLACED OR DAMAGED PACKAGES DUE TO POST OFFICE NEGLIGENCE. ** Contact your local USPS if you are unsure of damage control. Reprints MAY be available at a reduced cost if all other options are extinguished. LabelsRus has been in business since 1998. We are printing professionals who take our job very seriously. Etsy is not a hobby or part time job for us. Printing beautiful wedding products is what we're all about! If you're looking for a top notch team that will deliver top quality personalized labels, we're ready and waiting to help you. Go ahead and message us and 90% of the time you will get a response within minutes.